This paper presents the formulation of numerical algorithms for the solution of the closest-point projection equations that appear in typical implementations of return mapping algorithms in elastoplasticity. The main motivation behind this work is to avoid the poor global convergence properties of a straight application of a Newton scheme in the solution of these equations, the so-called Newton-CPPM. The mathematical structure behind the closest-point projection equations identified in Part I of this work delineates clearly different strategies for the successful solution of these equations. In particular, primal and dual closest-point projection algorithms are proposed, in non-augmented and augmented Lagrangian versions for the imposition of the consistency condition. The primal algorithms involve a direct solution of the original closest-point projection equations, whereas the dual schemes involve a two-level structure by which the original system of equations is staggered, with the imposition of the consistency condition driving alone the iterative process. Newton schemes in combination with appropriate line search strategies are considered, resulting in the desired asymptotically quadratic local rate of convergence and the sought global convergence character of the iterative schemes. These properties, together with the computational performance of the different schemes, are evaluated through representative numerical examples involving different models of finite-strain plasticity. In particular, the avoidance of the large regions of no convergence in the trial state observed in the standard Newton-CPPM is clearly illustrated. 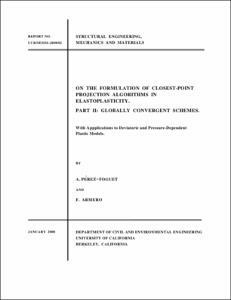 Pérez, A.; Armero, F. On the formulation of closest-point projection algorithms in elastoplasticity. Part II: globally convergent schemes. "International journal for numerical methods in engineering", Gener 2002, vol. 53, núm. 2, The definitive version is available at http://www3.interscience.wiley.com/journal/86513085/abstract, p. 331-374.